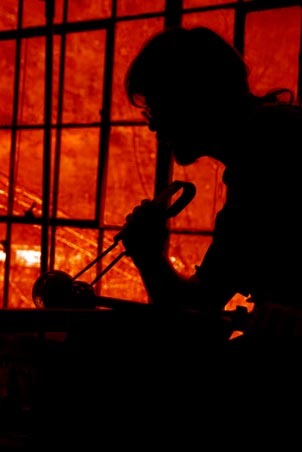 Vermont glassblower for 15 years specializing in torchwork design and sculptural fruit and animals; green glassblowing with a studio running off the hydro power of the dam; worked at Simon Pearce, Inc. and Orient & FLume Art Glass. 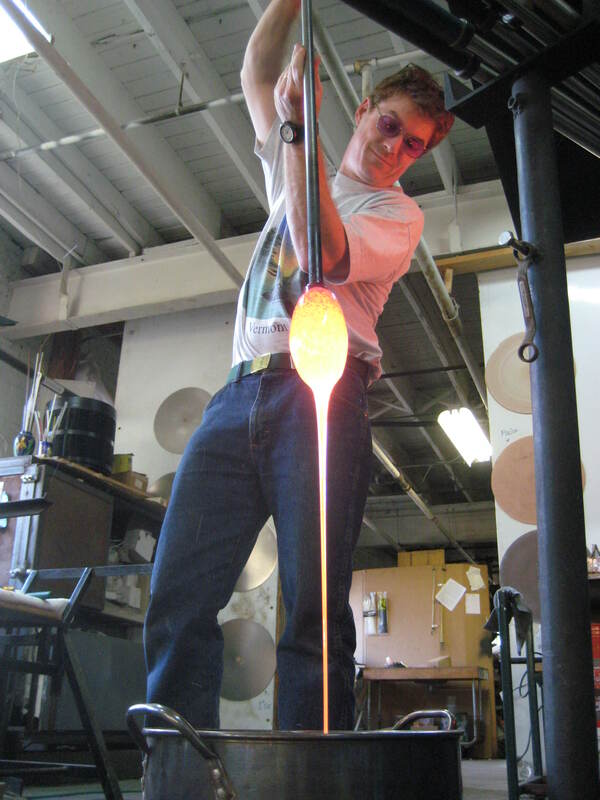 Glass has been an integral part of my life for more than 25 years, and I've been a Vermont glassblower for 15 years. In addition to glassblowing, I’ve also enjoyed exploring a variety of media and materials, such as music, ceramics, drawing, painting, and woodturning/wood burning. 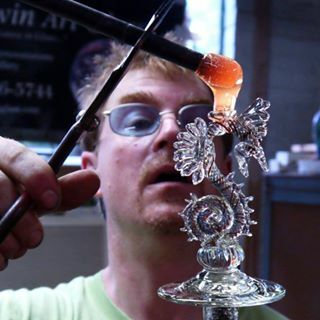 I first encountered glassblowing in 1991, as an “elective” during my senior year at Southern Connecticut State University, in New Haven, CT, while earning a B.S. in Liberal Studies, with a concentration in Special Education. After two years of working in Maryland as a residential direct-care worker for individuals with Developmental Disabilities, I returned to my home state of Vermont to begin my ‘lifepath’ as a glassblower. In 1993, I hired on as an apprentice with Simon Pearce, Inc., a prestigious glass facility in Windsor & Quechee, VT, known for their high-quality production of functional crystal. I became a journeyman glassblower and team leader, and my particular concentration was in stemware and handled pieces (pitchers, tankards, Irish coffee mugs, etc.) as well as various bowls and vases. In 1997, my fiancé and I moved to Chico, California, where she pursued her BA/Masters degrees in Speech Pathology and I worked as a glassblower at Orient & Flume Art Glass, an internationally-renowned glass studio, known for their iridescent vases, intricate paperweights, and torchwork designs. For the next seven years, I watched and learned from some of the “masters of the trade,” experimenting with new colors and techniques, developing and refining my own skills, and specializing in iridescent and torchwork design. I sold many solo and collaboratively-designed pieces on the “O & F” production line, and had my own successful retail section in the Orient & Flume showroom. In 2004, after our respective educations, wonderful adventures and life experiences, we returned home to New England to raise our daughter in the same close-knit community setting we grew up in, closer to both our families. For the next year I worked to set up my glass studio, and on August 28, 2005, Sherwin Art Glass was officially recognized by the State of Vermont as a business, complete with a scenic location overlooking the Connecticut River in Bellows Falls, VT. My studio runs with environmental concerns in mind; my furnace and all equipment (except my torch) runs off the hydro-power generated by the dam here in Bellows Falls. It feels good to be "green glassblowing" in the Green Mountain State, working in a medium that generally uses a lot of fossil fuels! Reduce - Reuse - Recycle! Our wonderful daughter is off to college now, pursuing Speech-Language Pathology.....I live about a mile from the studio with my wife, Cheryl, a Speech-Language Pathologist in the WNESU School District, and several furry, four-legged friends. When not blowing glass, I enjoy many outdoor sports and activities (especially disc golf, fishing, snowboarding, tennis), playing guitar, and spending quality time with my family and friends.